In Inherent Vice, a perhaps minor novel by Thomas Pynchon, that great chronicler of history at an angle, the pothead detective Doc Sportello frequently runs into, and gets help from, some science geeks — proto-nerds who use a semi-privatized version of ARPANET to help Sportello get info on the various people he’s hazily tracking. These are seemingly throwaway characters, just a few minor notes in the typical Pynchonian symphony of bizarre names and tangled plot strands and sinister conspiracies. But they are more than that. They are the prophets of our modern world, where everything is connected, and where not only can anyone with the right access track everyone else, but a huge majority of us give up our rights not to be tracked for the sake of convenience. These are the people who helped create the world in which Pynchon sets his latest novel, Bleeding Edge. 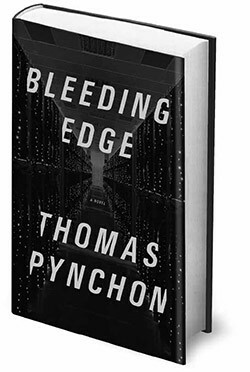 Thomas Pynchon’s Bleeding Edge is available wherever you prefer to purchase books and perhaps even more places as well. Don’t forget to check with his publisher for author events! Kidding. In his other novels, spanning the history of America, the dark shadow world of greed and sinister machinations was safely about something else: Mason and Dixon, miner strikes and oligarchs, WWII, the clash between the counterculture wave and the furious backlash. They were about America, but an America that came before. Now it is our history, our lives, to which Pynchon turns. Bleeding Edge is almost a novel of the present day, and, as such, it is his most uncomfortable novel for whatever percentage of his reading audience is post-Boomer. He’s already built a foundation of the America in which we live, a place with a staggering disconnect between rhetorical beliefs and life as lived. Mason & Dixon put down the groundwork, a commentary on America’s deepest original sins: both the obvious one, slavery, and the need for constant subdelineation — a drawing of lines, a parceling of wild and untrammeled land into something to be categorized, marked off, and made into commodity. That line, which Dixon imagines running across America and trampling over everything in its path, is one of Pynchon’s most frightening and vivid images. It connects his characters and books, and connects his philosophy. It is what connects the sprawling cast of strikers and strikebreakers in Against the Day to Gravity’s Rainbow’s Tyrone Slothrop to V’s wandering Hebert Stencil, looking for the mysterious figure behind the tragedies of the century, to Oedipa Maas, that fragile and broken young woman, who finally sees the suffocating rot all around. That line is one of increasing control, of some kind of System that might not control events, but nudges them, profits from them, and keeps everyone else befogged, unaware to see into the dim shadows all around. It is the mark of a Pynchon book to read it with a nagging incomprehension but also a shudder of chilly, vague recognition. There isn’t that distancing comfort with his newest novel, set in New York in the months flanking September 11, 2001. It takes place largely in the brief and now-distant period between the crash of the dot-com boom and that day. And this plot, as in many Pynchon novels, is deeply hard to follow. The main character, another in a long line of strong females, is Maxine Tarnow, single mother of two. Maxine, a “certified fraud examiner gone rogue,” now runs her own financial investigation shop — penny ante schemes, minor book-cookers, two-bit con men. She also has an ex-husband who isn’t far from her heart and, as the book progresses, her bed. There are clearly issues, but there is also still clearly love. Characters in Pynchon’s books must accustom themselves to coincidence, to chance meetings, to happenings-upon that aren’t so serendipitous. Everyone is connected: former Russian spetsnaz agents, Italian mafiosi with a heart of gold, old leftist agitators finding a place in the new world of cyber-anarchy, amateur documentarians with a knack for being in the right place at the right time, and, especially, that breed of computer geek, made of equal parts idealism and avarice. It is in that world that the plot mostly coalesces. There is a growing Internet behemoth, hashslingerz, whose CEO Gabriel Ice is a frequent target of Maxine’s investigations. The firm is trying to buy DeepArcher, a fantastic subweb full of avatars somehow perfectly reflecting their real-world counterparts, creating magical worlds in a sort of unexplained (or possibly not understood, even by its creators) hybrid of virtual reality, Linux and the early days of the Internet. Ice is interested in many things, including funneling money to groups that are either pro-jihad or deeply anti-jihad. It isn’t a spoiler to say that things converge, and the towers fall. Pynchon largely elides the events of that day — probably a smart choice, given that nothing in words can compare to the reality. But it also has meaning. In Against the Day, the thrust of the plot is leading up to the First World War, but the war itself glides by, in a refracting fog, distant and unknown. And that is what Pynchon does — he creates a world where this kind of horror is possible, for reasons never quite clear, and for which a satisfying explanation never comes. To dwell on the fire or the smoke or the dead gives us something tangible to hold onto, which, for Pynchon, is a way to evade the ultimate, terrifying truth. There is lead-up, there is horror, and then there is a pervasive and confused and elegiac sense of loss. It is here — the “truth” — where the book is at its most uncomfortable. It can be read as Pynchon, if not actually embracing, then at least tentatively touching the shoulders of 9/11 ‘trutherism.’ There are old UFO satellites connected by secret tunnels to the houses of the powerful. There are videos of mercenaries with Stinger missiles atop haunted midtown hotels. There are neo-liberal thugs, not CIA or FBI or NSA exactly, but with some group, haunting the shadows and Maxine’s soul. But for the most part, actual trutherism — Bush was behind it, for some never-quite-articulated reason — is laughed off, only to pave way for the deeper conspiracy. It was Al Qaeda, sure, but people benefited. The market knew to short airline stocks. Real estate developers salivated over what was to come. No one, it is postulated, knew per se, but the forces of greed, of late-stage capitalism, of vampire avariciousness, knew in their collective soul, and, as always, everyone else pays the price. That’s Pynchon’s paranoia, in a nutshell. Even if it doesn’t land on anyone, even if any of the particular conspiracies are debunked and are laughable, he creates a sense of a world just beyond our reach, a world beyond our control, of riot cops and spaceships and men in dark rooms — of violence that never touches the people it should. And that, I think, is why it is so uncomfortable for those of us of a certain age — it echoes our formative years. The days before September 11 seem wildly distant. Think about the 90s, and how deeply Pynchonian it was. There was this free-floating paranoia, a nation untethered from the explicable nuclear terror of the Cold War but not sure where to latch its fears. Wild conspiracies about Presidents and alien autopsies abounded, sometimes in the same breath. A time captured by “The X-Files,” a show that is (surprisingly, since it seems like a piece of pop culture Pynchon would feast on) only mentioned in passing. For many, that deep paranoia and anger was personified by Timothy McVeigh, who committed an atrocity we thought was unsurpassable in its horror. But that spring day of 1995 seems so distant. It is a cliché to say everything changed that September day, but it did. We entered another era, one that seems to be the exact world in which Pynchon has always been creating: a nation bored by wars, where protests are part of the background noise, where vast income inequality is dulled by booze and sports and reality TV, where injustice is shrugged at. And where, most importantly, the technology that was supposed to set us free has become a tool for unlimited spying, with programs like PRISM, a particularly Pynchonesque anagram. It isn’t a stretch to say that for Pynchon, all his books — his particular view of history, the story he has been telling of America — have led up to this one. Where even cyberspace, is, in the words of Bleeding Edge’s Eric, a former idealist-turned-hacker, “more lusers than users, keyboards and screens turning into nothing but portals to Web sites for what the Management wants everybody addicted to, shopping, gaming, jerking off, streaming endless garbage….” Like with all of Pynchon’s worlds, this is a little uncharitable, but looking at the flotsam of our culture, it is hard to say it isn’t largely true. There might not be an invisible hand guiding it, but the end result is the same. His love for, and mastery of, the language is clear on every page, and his boundless humor hasn’t waned. And there is warmth. Maxine’s love for her sons, Ziggy and Otis, is fierce and real, full of fear and hope. “It’s all right, Mom,” Ziggy says, as she ushers them out the door. “We’re good.” She replies, “I know you are Zig, that’s the trouble.” The world isn’t good. But Pynchon creates hope for decent people, in spite of everything. There are dozens of other characters and fascinating relationships, more and more. That’s kind of the point. Pull at any thread and 50 others come loose, till you’re stuck tangled in knots you never saw being tied. Pynchon is a master of creating a world that you never can truly see, beyond the dull mirrors of our daily lives. You’re never quite on solid footing, but you know you are searching for something. Things start to clarify, but as they always do with Pynchon, that’s when they start to make the least sense. It is our world at an angle, full of basements and secret passageways and snippets of half-remembered songs — dreams? — trying to tell you something vitally important. Brian O’Neill is a freelance writer based out of Chicago. He mostly writes about national security, but not always. He can be reached at cairobrian [at] gmail.com or @oneillofchicago.